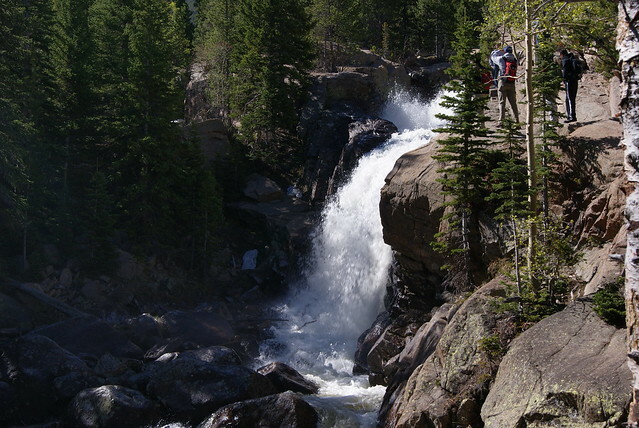 Let me start out by saying, that I am way behind on things, especially when it comes to finally putting together my write up of a little weekend trip out to Colorado to do some hiking. Not sure why it is taking this long, but what can I say; it’s been a busy month between this trip and today. As a result, this one is going to be one very long post. 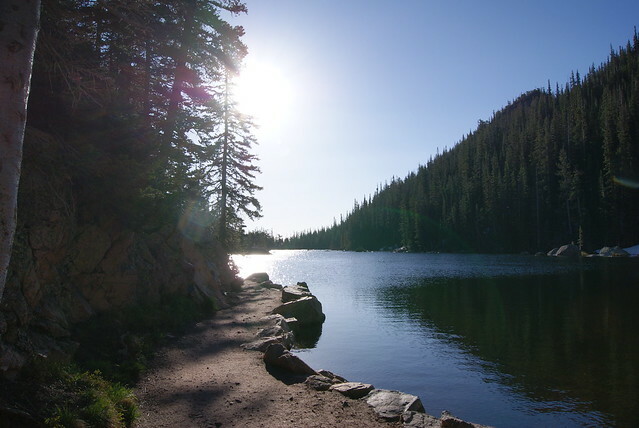 If you remember, last August I had decided to take a weekend trip to Colorado because I really wanted to do some hiking in the Rocky Mountains. 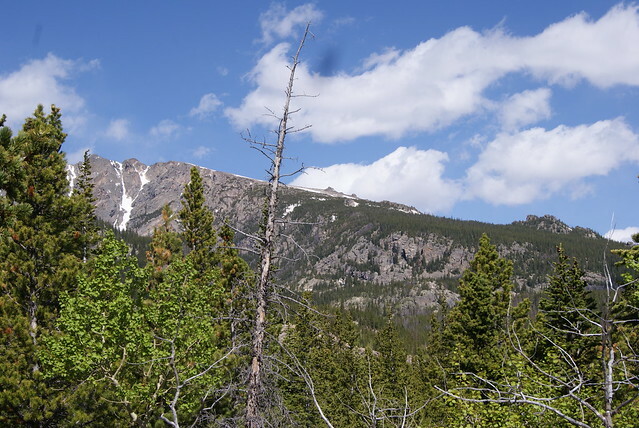 This lead me to Denver and Rocky Mountain National Park where I attempted and succeeded (against my expectations) a 4.4 mile (8.8 mile round-trip) hike up Flattop Mountain. I found the area extremely beautiful and afterwards found myself wanting more. 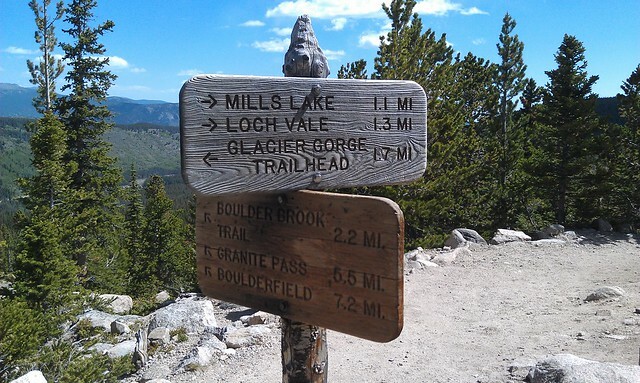 So on Memorial Day weekend 2012 I decided to fly out to Denver and try for a repeat, although this time nothing as crazy as attempting Flattop Mountain again. 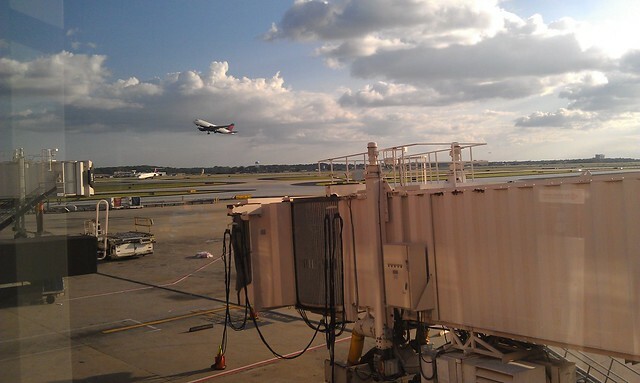 I wasn’t home for very long before starting out on this trip; the night before I had arrived back home on a Delta 737 from a work trip that had me bouncing all over the eastern US. This same plane (and the same SFO-based crew) was waiting for me this morning to take me back to Atlanta and then on towards Denver. The flight back to ATL wasn’t anything special, and my Atlanta layover wasn’t of any particular excitement other than talking to Verizon on the phone trying to figure out why data (3G or 4G) wasn’t working at all (hint: I wound up having to reset my phone to factory defaults when I got to Denver). Onward the flight to Denver was about as good as the last time I flew the route; I had received an upgrade in advance, so I at least was going to be in relative comfort for the short 3 hour flight. 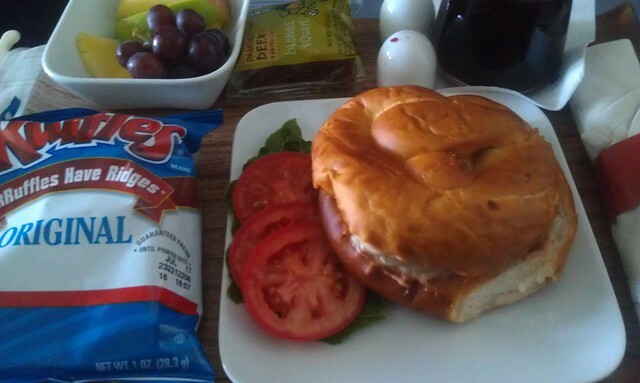 The flight duration also meant that a meal was served, and today’s option was a chicken-salad sandwich (I think) with chips, fruit, and a desert. I remember thinking “not bad” and “I wouldn’t mind getting this again” as well as “Ooh a Dancing Deer desert – I haven’t seen those in a while.” Only downside was that on the flight I had to abstain from beer or other alcohol due to not wanting it to affect my rather short time frame of acclimatization to the altitude. 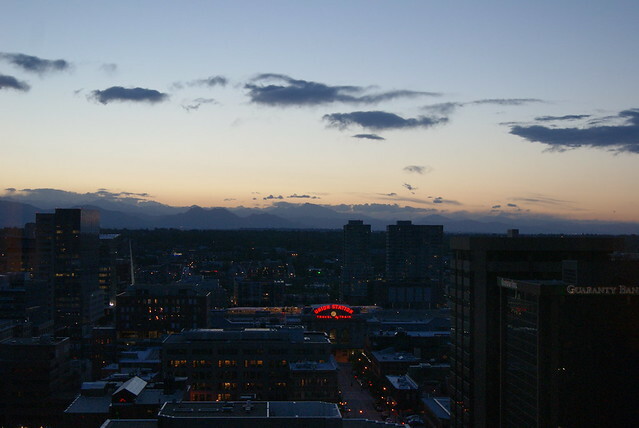 Upon arriving into Denver I was glad that this time it was daylight compared to my last trip that got me to the area late at night. With no data on my phone, I was not able to rely on Google Maps or anything to lead me in the right direction; and had to figure it out with the paper map from Hertz. I must have learned a few things in the scouts because I made it without too much of a problem. After parking my Subaru Forrester (not a bad small SUV in my book), I made my way to the lobby of the Westin Downtown Denver. 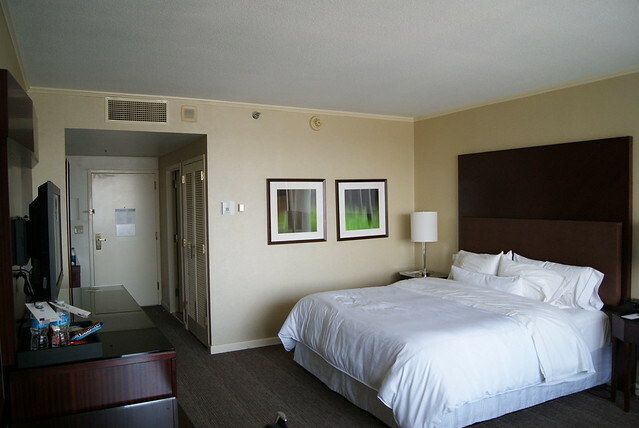 I’ve stayed at the Sheraton on the other end of the 16th Street Mall and wanted to try this hotel out this time. They were accommodating and got me a room with a view of the mountains which was fairly large and pretty nice overall. After getting settled I headed downstairs to wander the 16th Street Mall for a bit, to which I discovered that there was an even going on called Denver Day of Rock, which featured a number of stages with music. Eventually I headed out to the REI store near downtown to stock up on supplies for the next day. And like a usual visit for me to an REI, I came out of there with more than I had intended in the first place! I can’t say that I did anything too exciting that night other than get dinner. In fact I even abstained from drinking any beer as well; it doesn’t help with the acclimatization process and I really did not want to be miserable the next day. On top of all of this it also means I had to go to bed very early as it is about a 2 hour drive to the park and I wanted to get a very early start at the trail head. I surprised myself and got up as early as I wanted to around 3:30am; so early that I shared the elevator ride down to the lobby with a group who was just getting turning in for the night after a night of drinking. 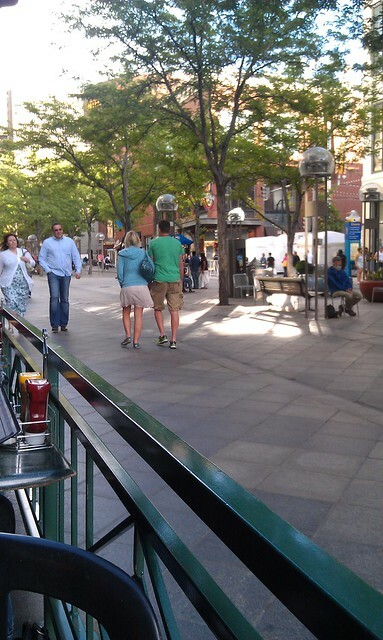 The streets of Denver were empty and quiet and soon enough I was passing through Boulder and then into the wilderness. This time driving the roads in the dark didn’t seem as nerve racking as last time and I think that had something to do with the fact that this time I got a Subaru Forrester from Hertz. Just as before with my last trip, I got to Estes Park as the sun was starting to rise and was still early enough to avoid crowds and having to pay an entrance fee to the park. I made my way down Bear Lake Road to the same trail head I started from last time, but this time the road was under heavy construction and had been turned into a temporary dirt road. Again I was glad to have the Subaru. 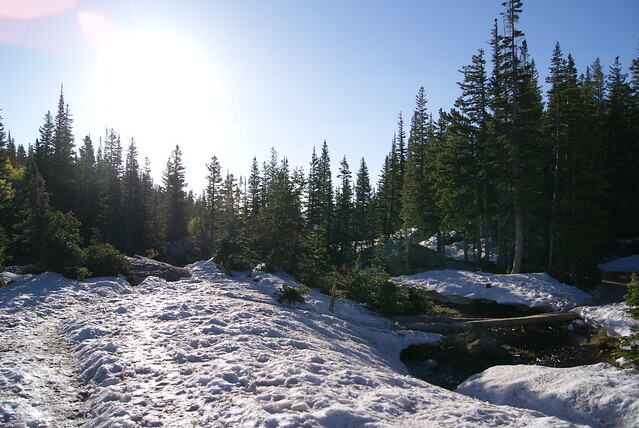 I reached the trail head and noted how cold it was up here at 9,475 ft above sea level – a brisk 36F according to the thermometer in the dash of my car. 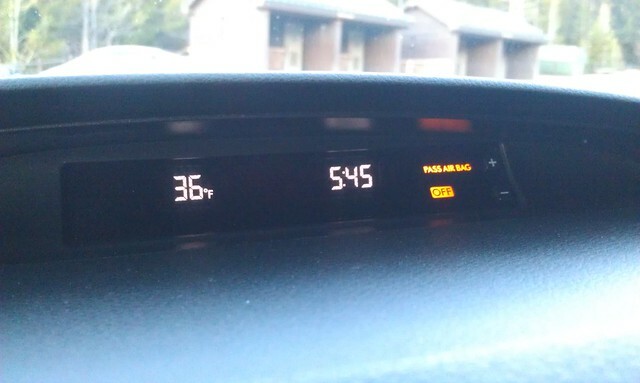 That morning while I was heading out I had only grabbed my jacket “just in case”, because I guess I would have thought it would have been slightly warmer. But that was probably just my Florida brain thinking since we start seeing hot days in March or earlier. 36F And Early….One Way To Beat The Crowds! 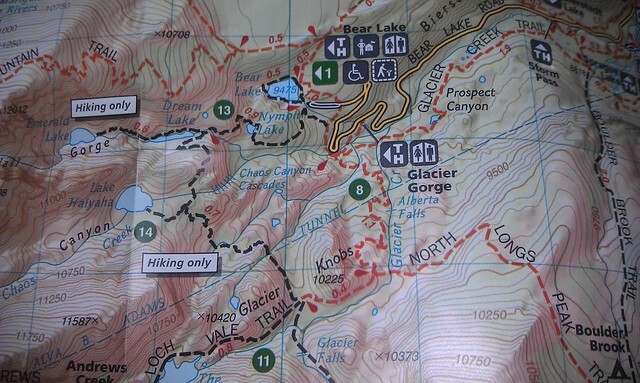 My plan for the day was to make a loop out of several trails, starting and ending back at the Bear Lake Trail head. I was going to head out towards Emerald Lake where I would rest for a moment before heading back to Dream Lake to hit the Lake Haiyaha Trail (with a diversion to the lake) continuing south to a point where several trails meet up and then heading up pass Alberta Falls and back to Bear Lake. It seemed like such a great idea, but there was one thing I just didn’t take into account: snow and ice. 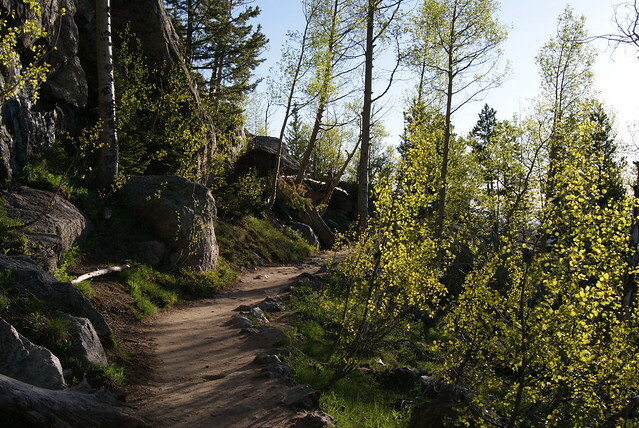 I had read the reports before heading up here and most trails indicated that they were mostly good, so I went forth. 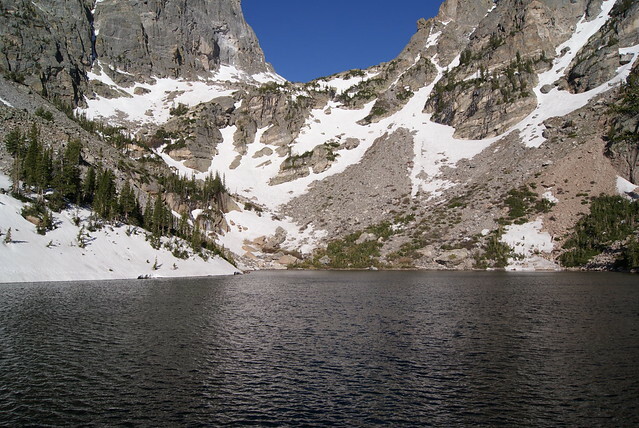 The only problem that I would eventually find out once I reached Dream Lake was that the trail heading south to Lake Haiyaha looked a bit unsafe for me with just my hiking boots…it was covered in ice and snow and with the sun rising, it would soon get slippery. Not exactly ideal conditions. Anyways, the first leg of my hike wasn’t that bad. Almost everyone I encountered had been heading back towards the trail head, so I take it that most had gone to watch the sunrise at Emerald Lake. It really didn’t take very long as I passed Nymph Lake, Dream Lake before reaching the end of the trail, roughly 1.5miles in. The isolation was fantastic; I sat there at the end of the trail on a rock alone in the mountains just taking it in – very beautiful and calming if you were to ask me. Once I headed back I started to encounter others heading in that direction, so I definitely made the right call in terms of starting time. End Of The Trail – Or Perhaps The Beginning Of It! Since my plan had been foiled due to snow and ice on the ground, I retreated to the trail head. From there I started working around my loop in a clockwise fashion (that’s largely the red part in the map above). When I started I wasn’t sure what my end destination was going to be. Initially I thought of heading to the Loch, but as I chatted with some fellow hikers on the trail I discovered that the elevation gain while not super-significant, was several hundred feet. 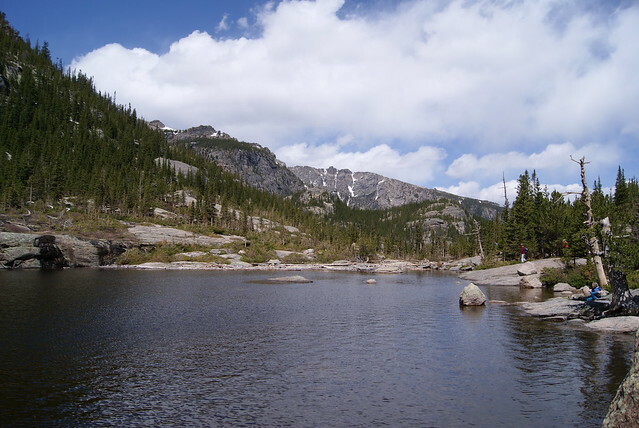 By the time I reached the four-way intersection of trails (lower portion of the map above), I decided that I head head south to Mills Lake via Glacier Falls as it had slightly less elevation gain or at least more spread out. Plus I had heard that it was a very picturesque spot, so why not? I was rewarded with a great spot to kick back and attempt to enjoy my backpacker cold black bean and corn lunch. 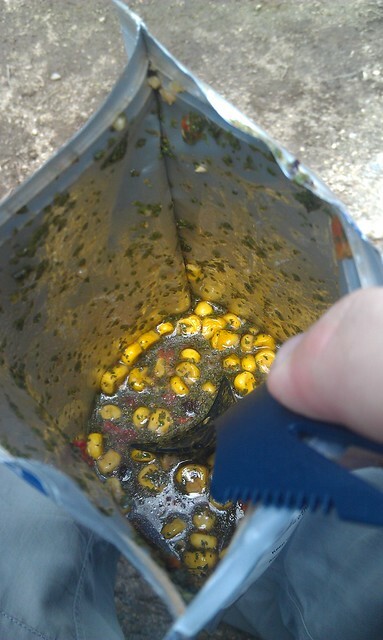 Several others had brought small stoves with them in order to cook a lunch and in the future I may just have to try that. I rested here for what seemed like an hour before heading back. I had roughly 3 miles to go to get back to the trail head and I could already feel the altitude from the first 7 miles or so of the day taking effect. Luckily there wouldn’t be a lot of uphill segments, but it still gets to you a bit. I was sucking down water pretty heavily too and even found myself opening up my “reserve” 1L bottle with a mile left to go. The downside with this hike was that the home stretch was uphill, and which took me way too long to get through. 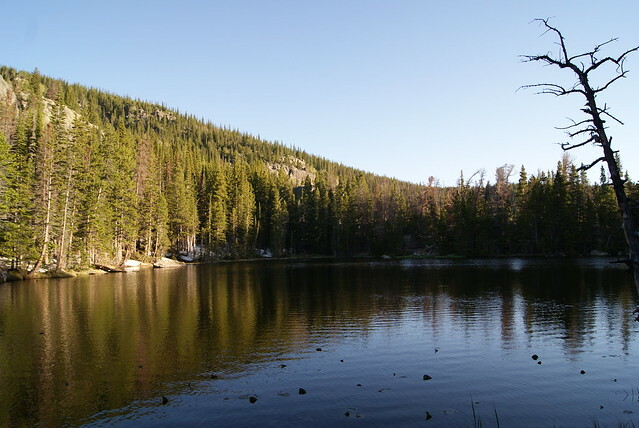 I almost went to a closer trail head and thought about using the shuttle system to get back to Bear Lake and my car, but I convinced myself that would be cheating or something like that. Eventually, I did make it back to the trail head and to the car. Just like my previous trip out there, the drive back was perfect. The sun was out, the temperature was good and really no bad reason to open up the sun roof as I coasted down the mountains towards Denver. Getting back to Westin in Denver I hoped that I wouldn’t feel beat down or 100% exhausted like last time when I hiked Flattop Mountain, because I sure did want to get out that evening. With my luck a shower and some ibuprofen was all that I needed. After a little bit of rest it was downstairs to the 16th Street Mall for dinner where I settled on the Paramount Cafe. It wasn’t terribly busy and I was able to get a table outside on the mall which is perfect for people watching. I went through many local beers there that night, some of them I wish I remember what they were, but well that’s become forgotten knowledge. I will say that the first sip I took though went all fizzy in my mouth. I don’t know if it was the altitude or the medicine I took to keep altitude sickness away on my hike or what, but it took me by surprise. Maybe it was just from going two days with any! Ha! 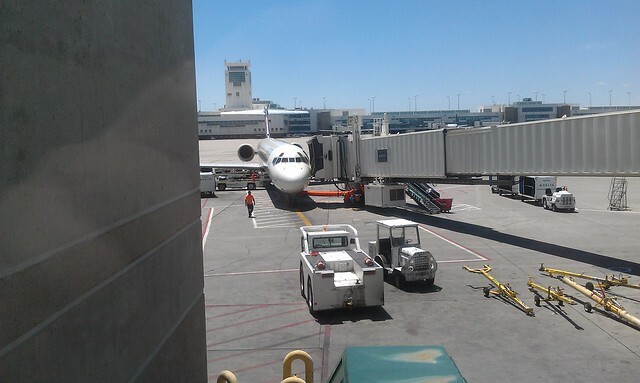 Anyways, there was no time for lunch so off to the airport it was. My only complaint with the Denver International Airport is that the car rental locations seem so far away from the terminal. Luckily I wasn’t cutting it super close, but I didn’t exactly leave myself with a lot of time either. Once inside and with my bag dropped at the Delta counter I was through security pretty quickly thanks to the premium lane; although it did mean just getting to the gate sooner to wait. Once on board I settled into seat 1B in First Class for the ride back to Atlanta. I cringed a bit when I found out I was sitting next to a kid no older than eight, but he was very polite which was the opposite of what I expected. 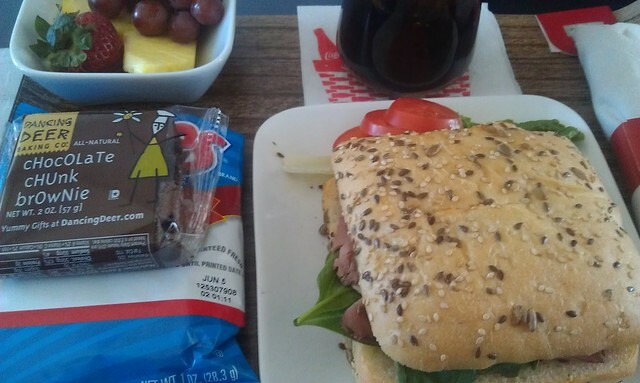 Once in the air, meals were served and I went with the Roast Beef sandwich. While it’s not exactly my favorite First Class meal on Delta (and meals generally have gotten much better lately it seems), it sounded better than whatever the other option was. As usual my complaint about the bread on this sandwich being rather dry still stands. Maybe someday they will figure it out. Other than that the flight was very remarkable. 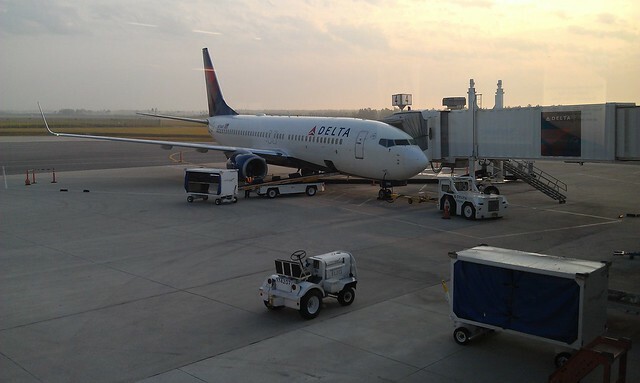 The same goes for my Atlanta layover and the flight back to Panama City. Once back home I realized how worn out I was. With being on work travel the Monday-Friday portion of the week before bouncing across the east coast and then flying to Denver on the weekend to go hiking I pretty much had zero energy left. Once I got laundry started, I just passed out on my bed. 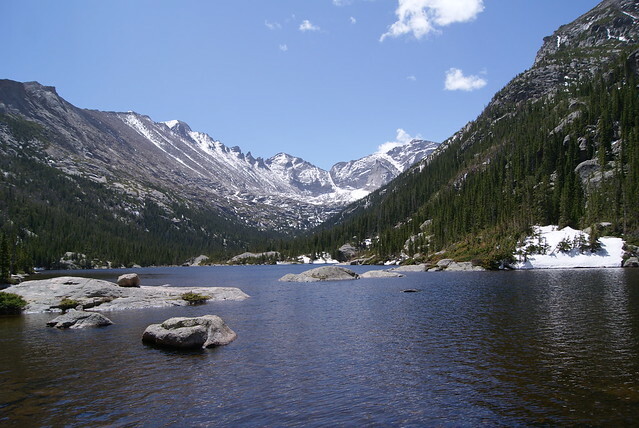 I’m glad I made the call to go out there to Colorado and Rocky Mountain National Park again. It’s really been cemented in my head just how beautiful it is out there and why I need to keep going back. 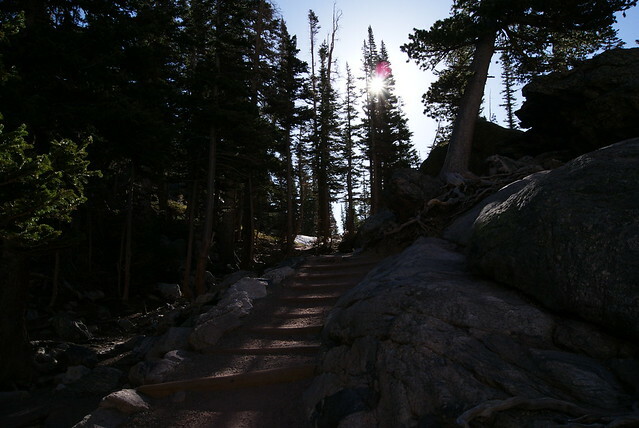 Sure maybe next time it won’t be Rocky Mountain National Park (or at the very least a different trail head! ), but I definitely need to make this a yearly thing. Or who know maybe I will head back out there again later this year….you just never know! This entry was posted in Delta, Hiking, Travel, Trip Report. Bookmark the permalink. Follow any comments here with the RSS feed for this post. Post a comment or leave a trackback: Trackback URL.